They were discovered at the back of a truck that had travelled to Ireland from France. EIGHT OF NINE men found in the back of a lorry in Wexford yesterday have sought asylum in Ireland. The eight refugees were processed by gardaí after being medically assessed at University Hospital Waterford. The refugees, all Kurdish, were discovered hiding in a truck in New Ross at around 3.30pm. Gardaí said they received initial treatment at the scene and are all now in good health. The eight men are in a place of safety and currently awaiting transfer to an asylum centre, gardaí said. 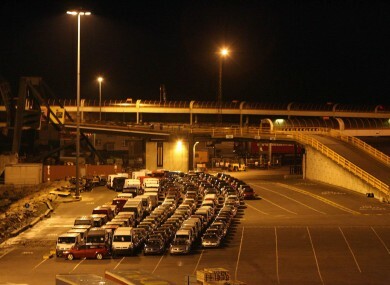 The group is thought to have spent at least two days in the lorry, which had travelled on a ferry from France to Rosslare. The ninth man found in the vehicle has been detained on immigration offences at New Ross Garda Station. His nationality has not confirmed. The Immigrant Council of Ireland, meanwhile, has said that such discoveries are “the direct result of the EU’s failure to honour commitments on resettlement and funding” in response to the migrant crisis. The NGO called on authorities to provide every possible support – including medical aid, access to swift immigration procedures and legal representation – to the refugees. Its chief executive, Brian Killoran, said: “While the arrival of refugees in containers in Ireland is unusual it is not unprecedented and it again highlights the fact that EU governments including our own have not honoured their commitments to offer protection, help and support to those fleeing war and conflict. “The first priority now is to ensure that those found are treated with humanity. “Any request they make to restart their lives in Ireland must be swiftly processed through fair and transparent immigration procedures. Email “Kurdish refugees found in back of lorry awaiting transfer to asylum centre”. Feedback on “Kurdish refugees found in back of lorry awaiting transfer to asylum centre”.